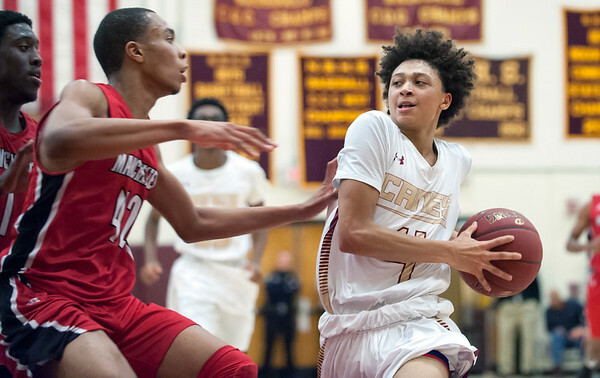 NEW BRITAIN - The CIAC released the brackets for the boys basketball tournaments on Wednesday and five of the seven New Britain area teams learned what their paths to possible state titles will look like. New Britain, Berlin, Southington, Goodwin Tech and Innovation all reached their respective state tournaments across Divisions II-V. The Hurricanes were the only area team to qualify in Division II. After finishing its regular season with a 15-5 record, New Britain earned the seventh seed and will host 26th-seeded New Milford (9-11) Tuesday at 7 p.m. The winner of this game will face the winner of No.10 New London (14-6)/No.23 Cheshire (11-9) on Thursday. Both the Blue Knights (14-6) and the Redcoats (8-12) qualified in Division III. Southington earned the seventh seed, while Berlin will be the 26th seed. This will one of the more interesting first-round games, especially locally, as the two teams will face off Monday night at Southington at 7 p.m. The Blue Knights enter the tournament on a hot streak having won its final five regular season games. Berlin, however, is entering the game having lost four of its last five games in the regular season. The winner will face the winner of 10th-seeded North Haven (12-8)/No. 23 Woodstock (8-12) on Wednesday. The Gladiators, meanwhile, finished with the best record among the local teams at 17-3, which was good enough to earn the fourth seed and a first-round bye in Division IV. Goodwin Tech will then host the winner of No. 13 Valley Regional (13-7)/No. 20 Windham (10-10) on Thursday at 7 p.m.
Goodwin Tech had been strong all season long. The team started the season 4-0 and continued to win 12 of its last 15 regular season games. Innovation qualified for the Division V tournament, finishing its regular season 12-8 to earn the No. 11 seed. The Ravens will host 28th-seeded Woodland (8-12) Monday night at 7 p.m. The winner of this game will then travel to fifth-seeded Parish Hill (15-5), who received a first round bye Wednesday at 7 p.m. Innovation beat Parish Hill in the CRAL Tournament finals Tuesday night. There were two area teams that did not make the tournament. Newington finished its season 5-15, while Plainville went 1-19. Posted in New Britain Herald, Berlin, Goodwin Tech, Innovation, New Britain, Newington, Plainville, Southington on Wednesday, 28 February 2018 18:19. Updated: Wednesday, 28 February 2018 18:21.